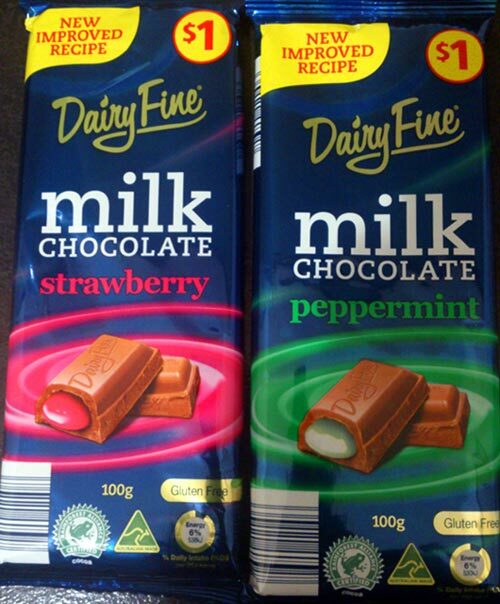 ALDI supermarket - 'Dairy Fine' assorted chocolates! I love the fact that each individual piece of chocolate of the choc block had the strawberry filling embedded inside, the milk chocolate coating outside had a lovely smooth and creamy texture and consistency, there's nothing to complain about the milk choc. However, my issue with this one was the strawberry filling, although I liked the nice gooey texture of the filling which was not too thick, but the strawberry flavour itself tasted clearly very artificial, so that was quite disappointing...I was hoping the filling would contain at least some traces of real strawberry, but sadly all I could taste from the strawberry filling was artificial flavours, and the colour of the filling was clearly artificial pink colouring also. I also checked the list of ingredients printed at the back of the packet and unfortunately the specific ingredients used to make the strawberry filling was not listed, it just says "Strawberry filling (40%)", which is quite odd, and it means that I can't be sure exactly what ingredients were used to make the strawberry filling. But if I'm just going to rely on my taste buds, then clearly the filling tasted of very artificial strawberry flavour and artificial coloring. 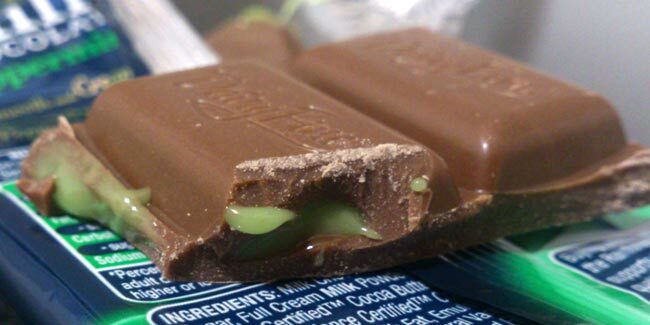 That was my only issue with this product...but then again, I shouldn't be too disappointed, since most confectionery manufacturers worldwide use alot of cheap artificial flavourings and colourings in their products anyway. Despite the disappointing artificial strawberry filling inside the milk chocolate, I think these chocolates are still a great product overall for your money's worth, considering they only cost $1 each! A 100g block of chocolate from a more well-known mainstream brand usually costs about AU$3-$5 here in Australia (depending on the brand and the shop), and usually it's just for a plain block of chocolate. So just $1 for a block of chocolate of this size is a massive bargain! and what makes these Dairy Fine chocs even better is that these are not just boring plain chocs, these chocs are more fancy with different kinds of fillings inside, so they are more worth your money! I would happily buy this again for the super cheap price! I had taken a few points off because of the disappointing artificial strawberry filling, I would've given this full marks if the filling had contained at least some traces of real strawberry. 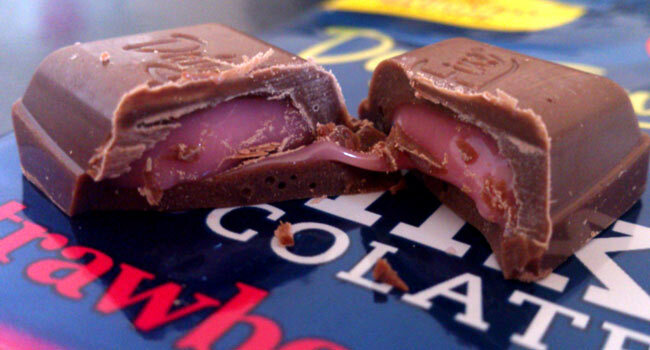 again there is nothing to fault the milk chocolate coating, it had a smooth consistency and texture, my only issue was the filling again...but this time it wasn't as disappointing as the strawberry filling one, I liked this peppermint flavour filling better than the strawberry one. I usually love mint flavour foods and sweets, and I'm quite familiar with mint flavours, and my taste buds did detect some actual peppermint oil in the filling, which I was happy with, because it means they at least had used some genuine peppermint flavours in the filling. However, I thought the peppermint flavour still wasn't quite as strong as I would've liked it to be...I also checked the list of ingredients printed on the back of the packaging and peppermint oil was indeed listed, however only a very tiny amount was used, I don't remember exactly how much peppermint oil was used for the filling, but I remember it was listed somewhere less than 0.50%, which is BARELY any trace at all! 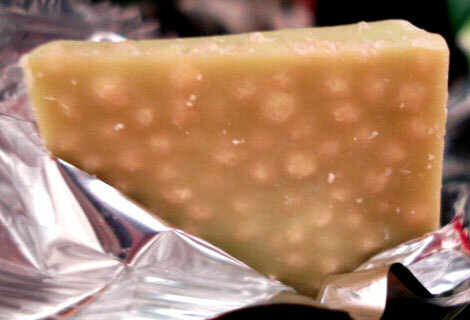 I understand that peppermint oil has a very strong scent and flavour and just a tiny amount is usually enough, but even the very minuscule amount used for the filling was still too little for my taste, even adding just a little bit more peppermint oil would've made a significant difference for me. But it just depends on personal preference, I like my mint flavour sweets & foods to have a strong minty flavour, and the peppermint flavour in the filling just wasn't strong enough for me. Oh well, I'm still more satisfied with this peppermint filling than the other strawberry one, and the gooey texture & consistency of the filling was really nice too, so I can't complain too much. Overall I think this milk chocolate with peppermint filling is definitely better, I will certainly buy more of this one the next time I shop at ALDI for my groceries! Have a great day everyone, and until next time, bye! Well technically Xmas has already passed, so I suppose it's a 'belated' Xmas greeting from me! Ok, so it seems like I have reverted back to my old habit of only updating this blog once every several months since my last update was 5 months ago I'm so sorry everyone, and I won't even begin to explain myself again about why I had abandoned this blog for so long AGAIN, I'm sure you all are tired of my excuses by now, so I won't waste anymore time and let's just get right into my food reviews for today shall we? these biscuits were really delectable, the biscuits had a soft but crispy texture and tasty, they were like mini 'Ritz' crackers. But the star of the show for me was the strawberry chocolate filling, it had a nice sweetness, but what I love about it is that unlike most confectionery manufacturers nowadays that tend to use alot of artificial flavouring and colouring, Bourbon used REAL freeze dry strawberries to make the strawberry chocolate filling, as the chocolate had a slight natural sour taste. Although the second photo is a bit blurry, but you can just barely see the real freeze dry strawberry bits infused into the chocolate filling. The sweetness of the chocolate combined with the sourness of the freeze dry strawberry bits was well-balanced and brought out a lovely natural strawberry flavour, and it complemented nicely with the soft & crispy biscuits. Overall these strawberry chocolate biscuits were really yummy and great to snack on anytime anywhere, I will certainly buy them again! 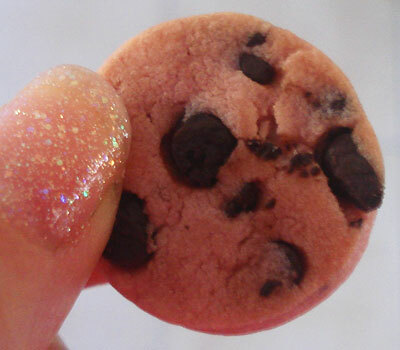 the texture of these strawberry choc chip cookies were also quite soft but still crunchy, I believe real strawberries were again infused into the cookie batter prior to baking because I was able to taste the same natural slightly sour flavour of strawberries in the cookies. The little chocolate chip pieces embedded in the cookies also enhanced the sweetness and added some nice texture to the cookies. Overall these strawberry choc chip cookies were really good too, however I think they're still not quite as yummy as the mini strawberry chocolate biscuits. Although I really appreciate the fact that Bourbon uses alot of real natural ingredients to make alot of their snacks and confectioneries, sadly unlike most other confectionery companies nowadays. Ok so these are my reviews for today...to be perfectly frank, I'm not exactly sure when I'll be updating this blog again, but hopefully it won't be too long, I'll try to update again in the next few weeks, ok? 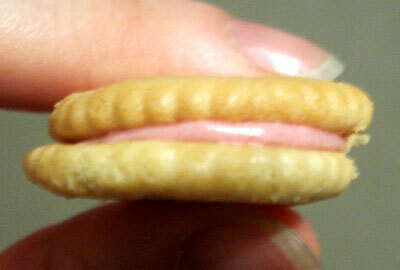 So today I will be reviewing 2 snacks I bought from Maruyu Japanese supermarket last week. The puff pastry cookies were very crispy and flaky, like puff pastry should be, and there were some caramelised sugar granules on top of the cookies, which gave the cookies a nice complementing sweetness, the sweetness from the sugar was not too strong, but mild enough to complement the puff pastry cookies. The chocolate filling inside was also good, although it had solidified instead of being soft and smooth, but that didn't bother me much. Overall these milk chocolate 'Pie no Mi' cookies were really yummy, definitely better than the strawberry cheesecake flavour I reviewed in the past, they are certainly worth coming back for more! 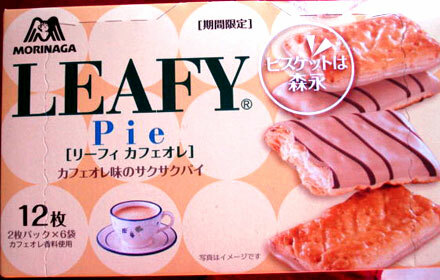 as you can see they're not really "pies" (at least not in the conventional sense in the western world) they are actually cookies made of pastry, but in Japan however, pastry cookies like these are apparently called 'pies', I don't know why. But with my many years of observing Japanese culture & pop culture, I've come to realise that the Japanese sometimes use certain english words differently to how they're normally used in the western world, which results in the disparity of the meanings for certain words or names in Japan. Anyway, so these cookies were also made of puff pastry, they actually resemble French butterfly pastries aka Palmiers, they probably are anyway, the many layers of pastry shaping the cookies gave them some nice texture and soft crunch and crispiness, the cookies also had a subtle but pleasant amount of buttery taste. There were also caramelised sugar granules coating the outer edges of the cookies which helped to add some sweetness to the cookies and balance out the buttery taste. 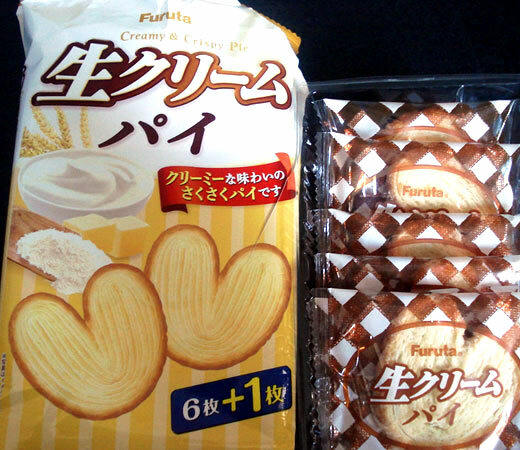 The only complaint I have about these pastry cookies is that on the package it clearly markets the cookies as "creamy & crispy", they were certainly crispy, but not "creamy" at all. Today I will be reviewing 2 more snacks from Bourbon's popular 'Petit' series; mini white chocolate and matcha chocolate biscuits/cookies, they're virtually the same as the mini milk chocolate biscuits I reviewed last time, only with different types of choc fillings. like I mentioned before, these white choc biscuits are virtually the same as the milk choc ones, these biscuits also have the same lovely soft and melty texture as the milk choc ones...and just like the milk choc biscuits, the white choc filling in these biscuits were also rather basic and nothing special in comparison to the soft biscuits. However overall, these white choc biscuits were still really yummy, the soft and melty biscuits were still the star of the show, and although the white choc filling was plain and ordinary, it was still sweet without being overpowering. 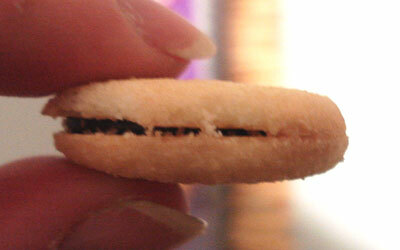 And again, the white choc filling was complementary to the soft biscuits. 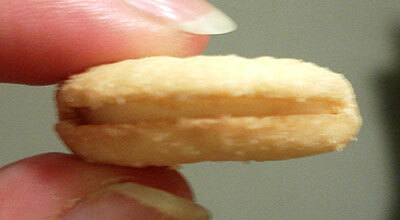 Like many of the other yummy snacks in Bourbon's 'Petit' series, these white choc biscuits were very well executed. once again, the texture of these mini biscuits were delightfully soft and melty, and matcha chocolate is more special compared to just plain basic milk and white choc. 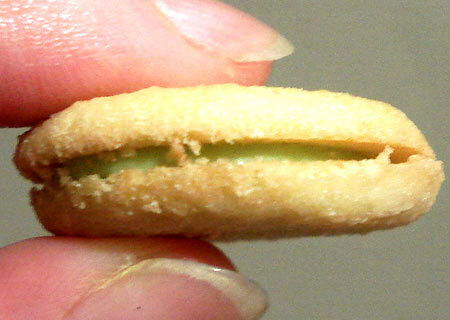 But although I was able to taste the bitter flavour of matcha in the green choc filling, I feel that the matcha flavor could've been a little stronger, the makers at Bourbon could've infused a bit more matcha powder into the chocolate. For me personally, the matcha flavour was just not strong enough for my taste, therefore the balance between the bitterness of the matcha and the sweetness of the chocolate was not consistent, at least to me, so that was a little disappointing for me. However overall, these matcha biscuits were still oishii (yummy), they just needed a little more matcha flavour in the choc filling, that's all. Here's my 4th review about Bourbon's 'Petit' series snacks, I have to admit that lately I've become OBSESSED with these little treats! They're convenient, affordable and most importantly, they're really yummy! Today I will be reviewing this pack of mini chocolate biscuits/cookies from the 'Petit' series, apparently it's 1 of the classic favourites from the series, so of course I was urged to give it a try, especially since Bourbon's 'Petit' series is 1 of my favourite snack brands! 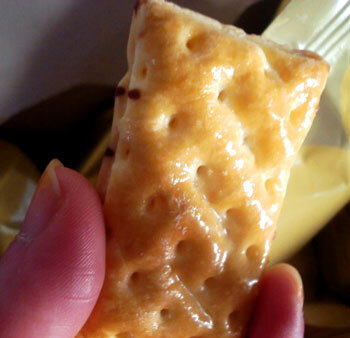 the first thing I realised when I popped one of these small bite-size biscuits into my mouth was how soft the texture of those biscuits were! I was pleasantly surprised, they were soft and crumbly and actually melted in my mouth, I didn't even need to bite into it, it started melting almost as soon as I had popped them in my mouth, even faster than the chocolate filling itself. 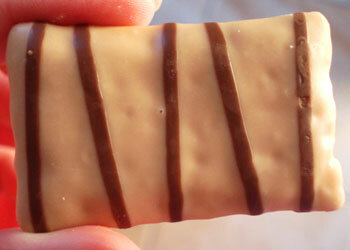 The chocolate filling that was sandwiched between the biscuits was just basic milk chocolate, and although the choc filling was nice, in contrast to the soft biscuits, the choc filling was simple and frankly, very ordinary and nothing special. Overall these mini choc biscuits were very yummy too, I love the soft and crumbly texture of those biscuits, and as ordinary as the chocolate filling was, it was still nice, I mean, who doesn't like chocolate? 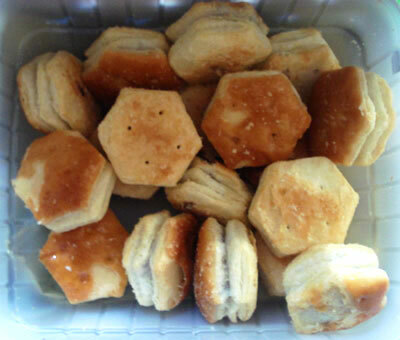 But the star of the show is definitely those soft biscuits! 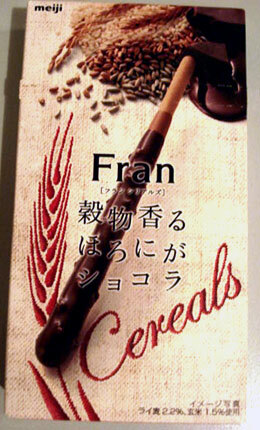 However I always try not to forget to review the various non-Japanese snacks at least once in a while (even though I can be quite forgetful at times)...however, since it has been more than a year since I last posted a review about a snack that is not from Japan, I decided it's about time I do so again...before I forget again! 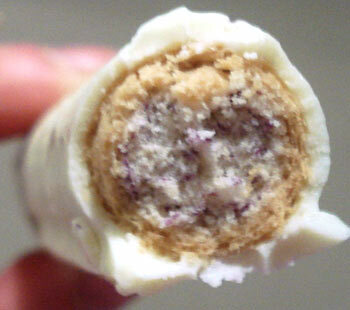 basically they were wafer rolls filled with a taro filling and coated with white chocolate, the taro filling had a powdery texture and consistency, when I read the list of ingredients in the back of the box, I realised that taro powder was indeed used, so I assumed that the taro filling was the taro powder. I will comment on the taro filling first, which unfortunately was a big disappointment...even with its impressive and relatively accurate colour, the powdery filling was basically tasteless; I could not taste any trace of taro, in fact, my taste buds were not able to detect any sort of flavour at all in the filling, the flavour was just bland and much too subtle. But despite the disappointing taro filling, there were some upsides to these Choco rolls too; the wafers were crispy with a nice soft crunch to them, and the white chocolate coating was substantially thick and sweet. 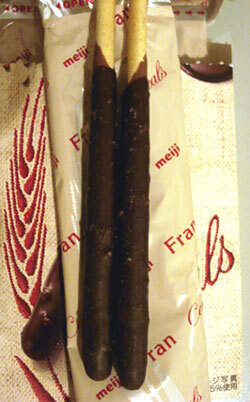 No doubt the wafers and white chocolate coating were the only form of redemption for these choco rolls. However, because of the bland and tasteless flavour of the taro filling, the balance of flavours was very inconsistent, which meant that the only flavour I was really able to taste was the sweetness from the white chocolate coating. But in the manufacturer's defence, it's always not easy to incorporate taro in a confectionery and execute the taro flavour effectively without using any sort of artificial flavour enhancer since taro itself naturally has a very subtle flavour. 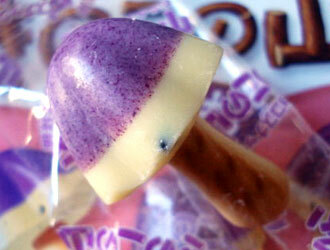 This is why I am often quite wary about taro flavoured sweets and snacks. 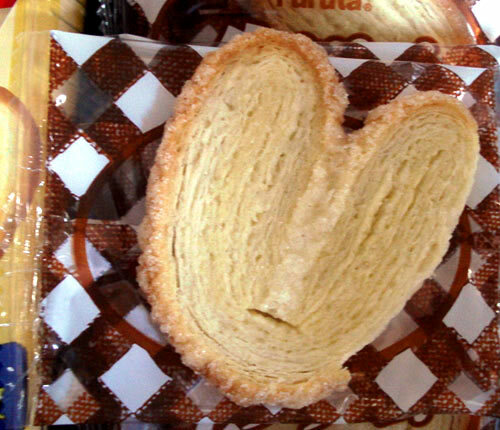 After a while though, the sweetness from the white chocolate became a little too excessive for me so I ate about 3/4 of the choco rolls and gave the rest to my fiance. 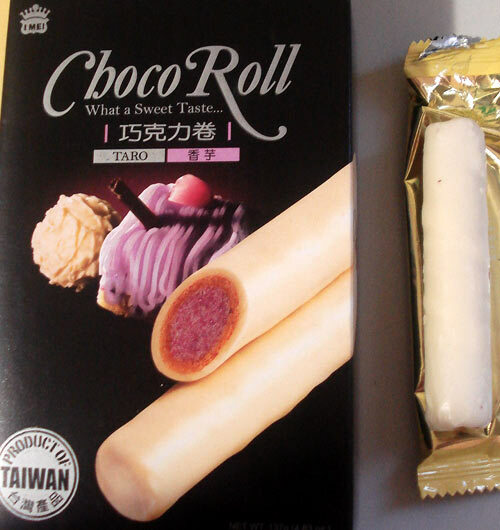 Overall these taro choco rolls were decent, the wafer rolls were very nice and crispy and the white chocolate coating was quite good, very substantial but a little too sweet for my taste after a while, I loved the wafer rolls the most. The only let-down of the whole product was that bland taro powdery filling; which in my opinion, should have been the star of the whole snack, but sadly it wasn't. 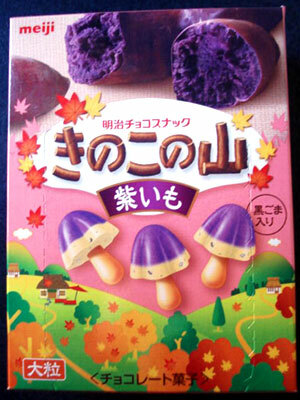 Would I want to buy these taro choco rolls again? Probably not. Sorry for yet another very slow update, the last few weeks for me has been rather crazy with so many things going on that I haven't had the chance to update this blog. The box contained 12 individually wrapped smaller pieces of chocolate so you can share the little treats with others. What I love most about these Crunky chocolate snacks are those little crispy malt puffs embedded throughout the choc, they give the choc some very nice texture, crunchiness and crispiness. This matcha ice cream flavor was no different in terms of the texture due to the malt puffs. 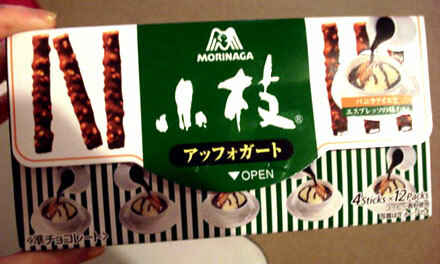 The letdown with this particular flavor was the matcha ice cream flavored white chocolate itself. Although you can't really see it in the photo itself because of the lighting & angle, but the chocolates had a very nice tint of soft pastel green, but the flavor was very weak to the point that the matcha flavor was non-existent. Although it's true that the flavor of matcha is significantly reduced when made into ice cream, so I was not expecting the matcha flavor to be particularly strong anyway. However in all those matcha ice creams I've savored over the years, they all retained at least a little bit of matcha flavor, so I was expecting at the very least a hint of matcha flavor in those chocolates, but there wasn't any, not even a little tiny hint of it. Either the matcha flavor was simply non-existent or it was just too weak and overpowered by the sweetness of the chocolate. 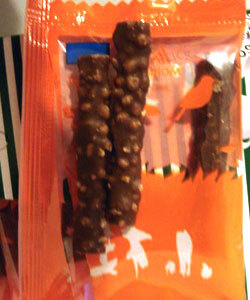 But the consistency of the chocolates was good, rich and smooth, just the flavor was very lacking. 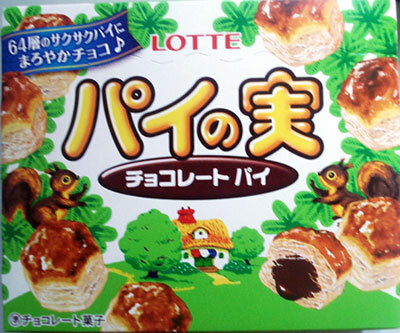 Overall this was not a particularly good attempt by LOTTE in terms of execution due to the lacking of accurate flavor, but I will give points for the yummy crispy malt puffs & the smooth consistency of the chocolate. 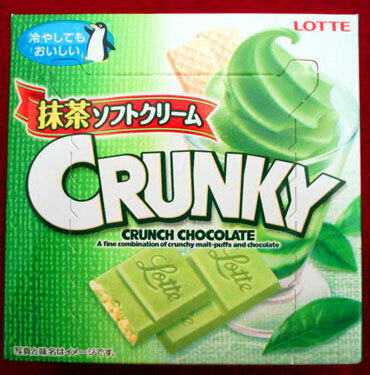 This is no where near as good as any of the other Crunky flavors I've tried over the years, that's for sure.